- Who is the manufacturer and style # of the over the range vent? thank you! Okay, I think I've read the whole thread but am unable to find a Broan or Zephyr insert with baffles that appear to be black like these. Is the picture misleading, or did you darken the stainless baffles of a Zephyr? How did you hold it up? It is obviously attached to the wall, but how was that done so that it did not have to be supported from above? We have a free standing range behind a counter that needs this hood. What is the brand and where can we locate it? This hood is custom made by Sullivan Building & Design Group and our millwork company CiderPress Woodworks. The "guts" are an insert that can be purchased from many appliance and hood manufacturers. - i like this one. where to buy? The blower can be in the hood, most are. This one just happens to have the blower mounted on the roof so it is less noisy. Now I see the chase over the wood trimmed part of the hood. There are recirculating range hood inserts but I don't know if any reliable major brand has one. How does the fan vent out? I love the hood/vent/blower--what brand and where can I get? THank you! The vent is an insert which is made by Broan as well as lots of other kitchen hood manufacturers. The motor is a "remote" unit mounted on the roof. It is not necessary to have a "remote" fan. These units are made with integral fan motors also which are installed in custom cabinetry and simply vented out the side wall or roof. - What is the vent brand/model in this picture? Thanks! absolutely love the vent ! how much is it? 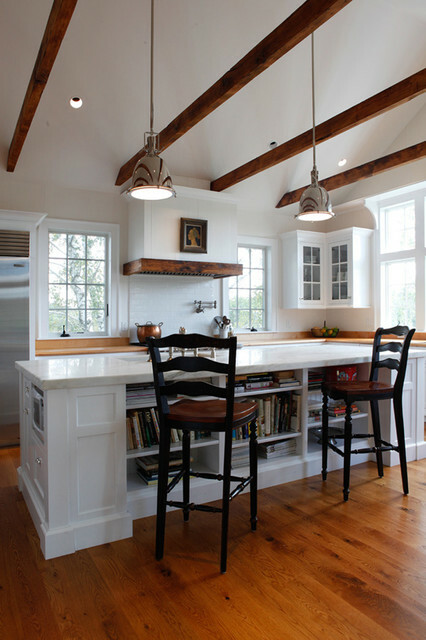 - This hood photo has been one of my favorite photos on Houzz for a long time. The rustic, modern sophistication element is perfect. I am working on doing the same in my small u shaped kitchen. I have researched the inserts and I think it will work. If you still have the wall and cabinet paint colors and could provide them, I would be so thrilled. 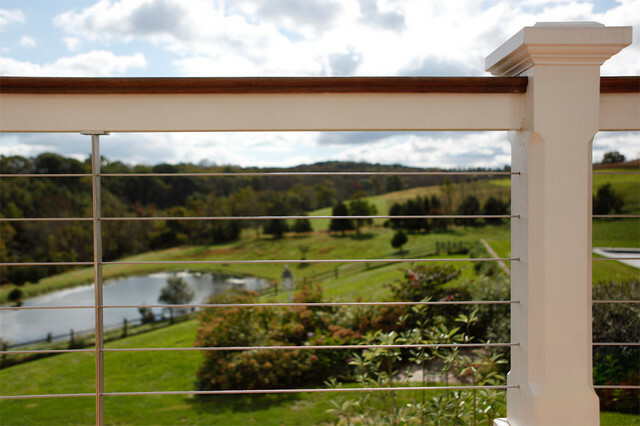 The views through the steel cabled deck are stunning. Thank you so much for all your advice on this beautiful piece of work. We hope to do something similar. So inspirational. How did you scure the reclaimed beam? back of the beams you have to cover any face screws that you may need. Thanks Neil. Right after posting my question I realize I could screw from the inside (well, if I have room to do so!). Plugs is a great idea, thanks for the tip and answering my question! Great work you guys do! 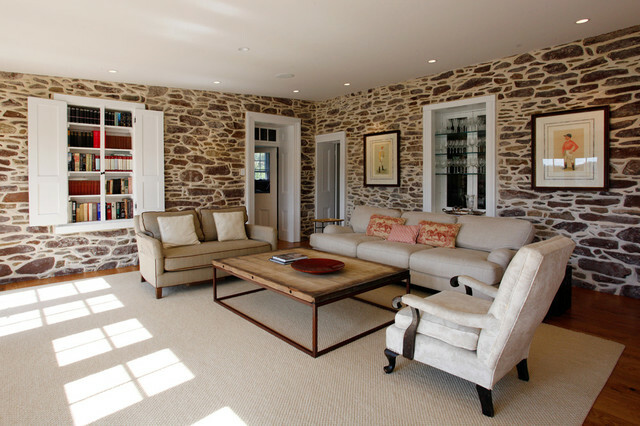 I'm in Chester County so close to you guys and really like all of the work you do on old homes. thanks again. Enzo. - Do you foresee a problems with discoloration of grout from cooking. What venting systems work best when using an insert hood? Regarding the tile: We highly recommend a good grout sealer and clean wall regularly with a clean cloth. Fans are rated in cfm. About 600 com fan is adequate but bigger is always better if it is not noisy. Also some building codes require make-up air if your fan has 900-1200 com. - I love this hood. I am wondering if I can use a similar treatment as my 36" range will have upper cabinets on either side of the hood. I am concerned that a "box" constructed to house the duct work would interfere with opening the doors of the cabinets. Can you tell me how far the box projects from the wall? What model Broan filter did you use? My appliance dealer recommends a 600 cfm blower. Would smaller version of the filter you used be compatible with a 600 cfm blower? Box is about 21" from back wall. Filter came with unit. Pot fillers are made by most good plumbing manufacturers. (Grohe, Rohl, Kohler...). This oven hood was custom made by Sullivan Building & Design Group. - Is this a hood with a recirculation kit &amp; filter, rather than a duct to outside? This hood has a remote blower mounted on the roof. This is a custom hood with an insert and remote blower mounted on roof. Any good carpenter could build this. It is a wood frame around the insert hood and tongue and groove vertical boards with an old beam used to trim the bottom. Crown moulding on top. what size is the old beam? especially the width and depth. 3"x5"? This is a Wolf range and the red knobs are available from your local appliance dealer. Check out the Blue Star ranges. The ranges themselves come in over 900 colors and many different colors of knobs are available as well. - Where can I find the picture above the range? That was an owner provided piece of artwork. the water tap that is in the photo, where can I get one from? Thanks! - Where is the control panel located for the hood? 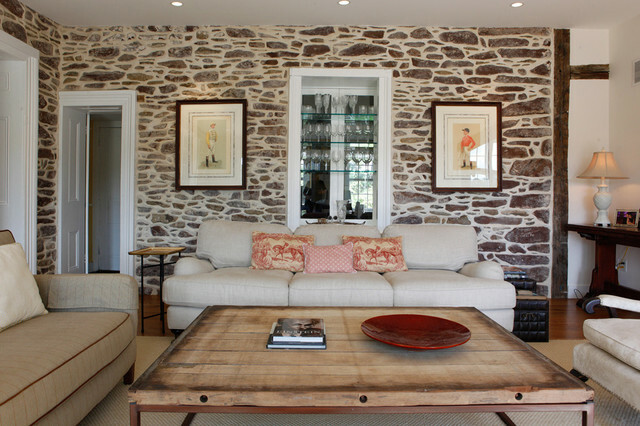 We are trying to achieve a similar look with barnwood. The fan itself is an insert and the controls are located just behind the wood beam trim. They are mounted to the fan itself. What type of reclaimed wood is wrapped around the hood? Type of wood is not really important. 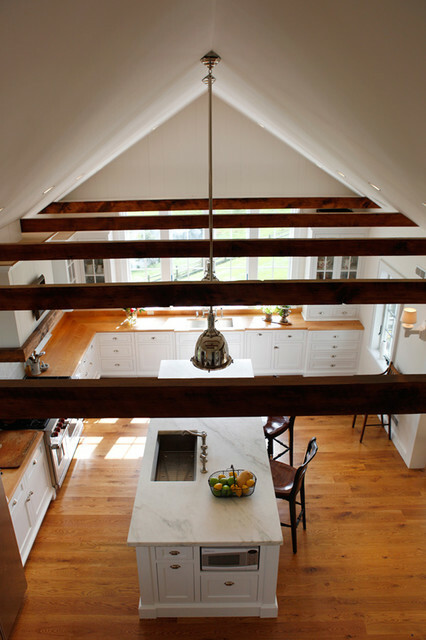 Reclaimed beams such as this are available at many salvage building material stores. They may be oak, pine, hemlock etc. The beauty is in the eye of the person making the selection. Sometimes they are sentimental pieces from old trees on someones property or a floor beam from grandmom's house. distance between stove and vent bottom? - Looks more than 24". What is the max? Yours? Lovely work! This hood is mounted 33" above stovetop. 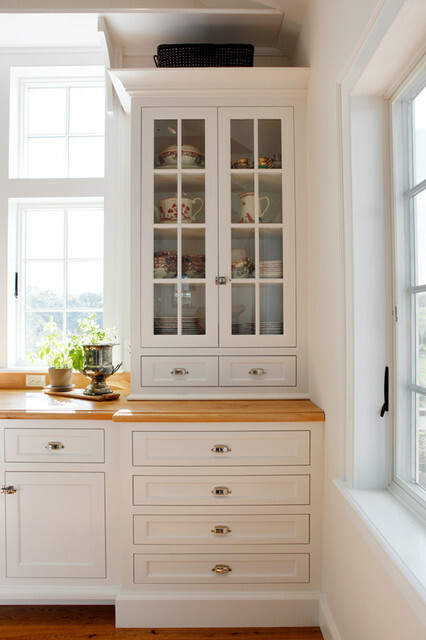 - Who makes the latch and pull hardware on cabinet doors? 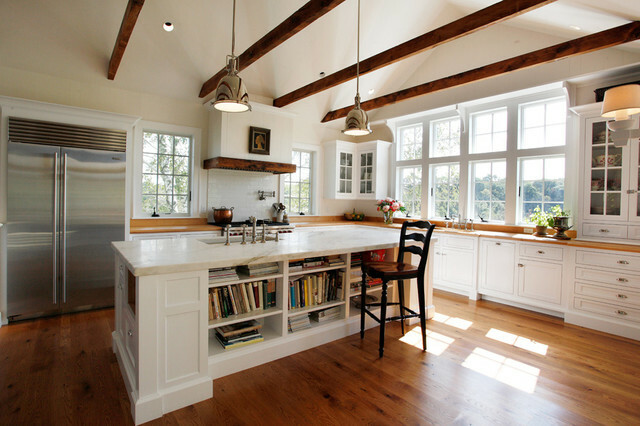 What are the counter tops? - These countertops look wood-colored but maybe a different material? What is the source of the pot filler? Thanks. It is a Rohl Country Kitchen swing arm pot filler. Above this fan is a wall. Can you build this without anything on top? - Is there a wall above the wood trim because the size of the insert is large? - Who makes this vent a hood? 5. The right range hood. 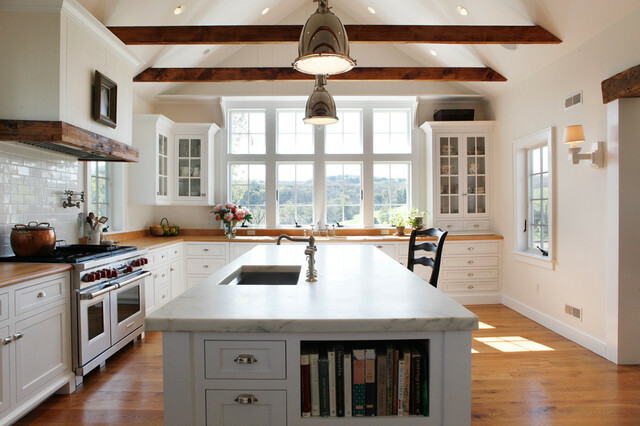 With all the choices that go into designing a kitchen, it’s only natural to feel some selection fatigue at some point. 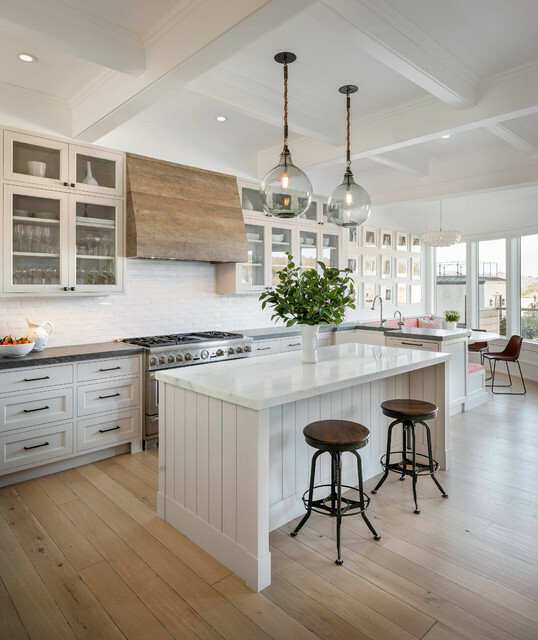 But don’t lose steam, especially when it comes to choosing a range hood, which can establish an eye-catching focal point or recede to let another element become the star. 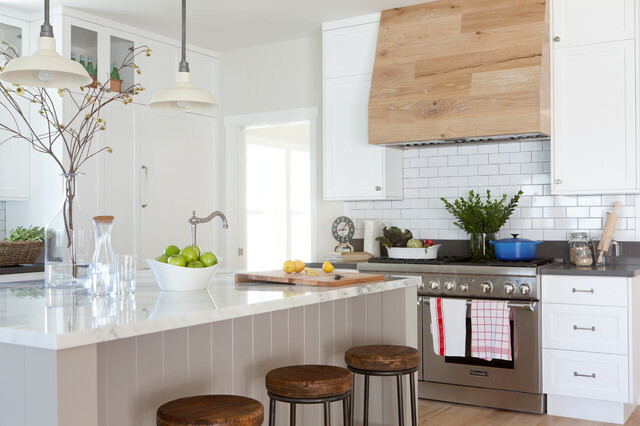 This week, Houzz writer and editor Erin Carlyle has broken down how to get your range hood right. A more luminescent wood tone brings sophistication to the range hood in this close-up shot. 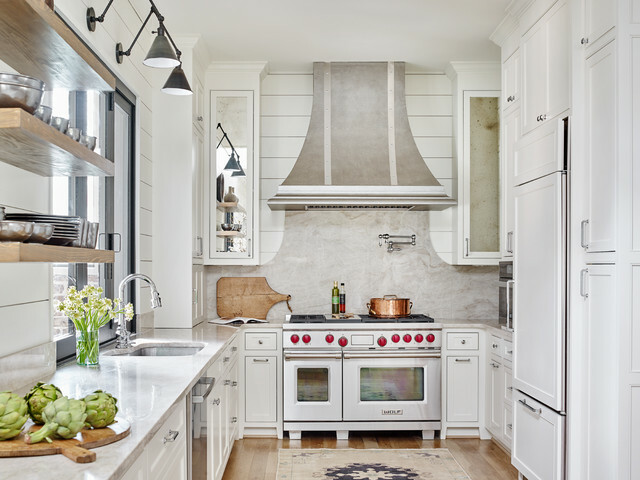 This range hood style shares some characteristics with the previous example. 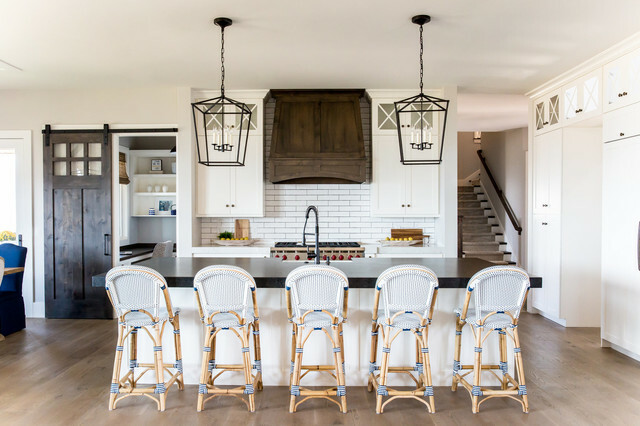 Do you have a unique range hood? 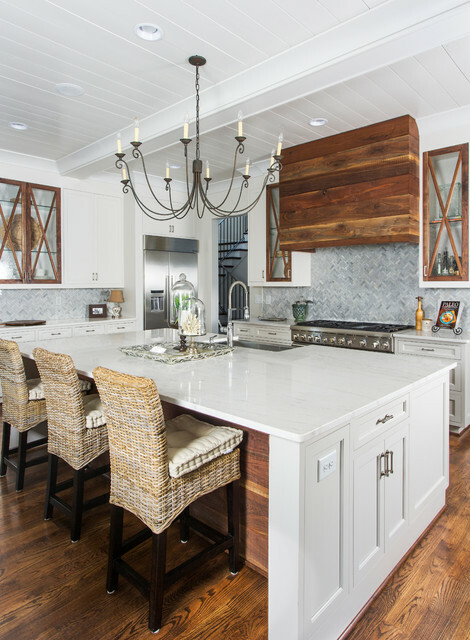 This custom wood hood by Sullivan Building &amp; Design Group was built from old beadboard paneling and antique wood beams, which enclose a Broan fan insert with a roof-mounted remote blower. 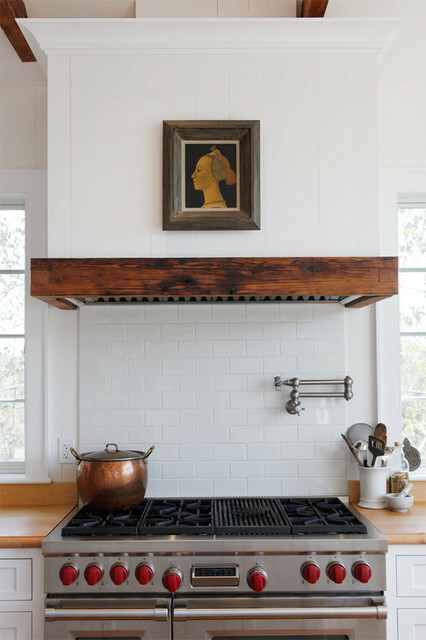 Have you found a creative way to keep your range hood visually light? Please tell us about it and share your best photo in the Comments. Accents of Warm WoodA wide range of materials are being employed when building and fabricating hoods. In a design mixing modern lines with a rustic material, this custom made hood by Sullivan Building &amp; Design Group features a band of a reclaimed beam wrapped around its lower edge.Tip: Look for reclaimed wood at salvage building material stores, and hood inserts from appliance stores or hood manufacturers. And don’t fret over any airborne cooking deposits on such a surface; it has weathered the outdoors, it will weather anything else that can be thrown at it. StovesGas stoves are most cooks’ preference because they allow for greater control than electric. But because they produce carbon monoxide, carbon dioxide and nitrogen oxide, gas stoves can be especially troublesome for asthma sufferers.Alfred Zamm, M.D., author of Why Your House May Endanger Your Health, believes that gas ranges could be a hidden culprit in “housewives’ malaise.” He writes that a gas oven operating at 350 degrees for an hour can cause kitchen air pollution comparable to a heavy Los Angeles smog. Without a ventilation fan, carbon monoxide and nitrogen dioxide levels can zoom to three or more times that. Carbon monoxide is a toxic gas that can cause headaches, central nervous system damage and depression. Nitrogen dioxide exposure can cause respiratory and lung problems.Architect Paula Baker-Laporte, who has written several healthy-home books, recommends:Always run ventilation range hoods to outside the house.Install the largest range hood you can find and specify variable speed control.Adjust flames so that they burn blue. A yellow flame indicates incomplete combustion and carbon monoxide production. This power pack has been combined with an external or remote blower. The external blower isn't visible here, which is a beautiful solution with the simple face and wood trim.A custom unit above a sealed gas-powered stove typically requires 42 inches of clearance to combustible surfaces. A regular gas stove requires 36 inches of distance to the hood. Since a lot of decorative covers are designed to extend on either side of the range's width, they'll also have a bottom panel where the power pack is installed. You'll need to either choose a noncombustible material for the bottom panel or move the hood fan up accordingly. Brad Sullivan of Sullivan Building &amp; Design Group shares the details of this custom wood hood: "The fan itself is an insert by Broan with a roof-mounted remote blower. 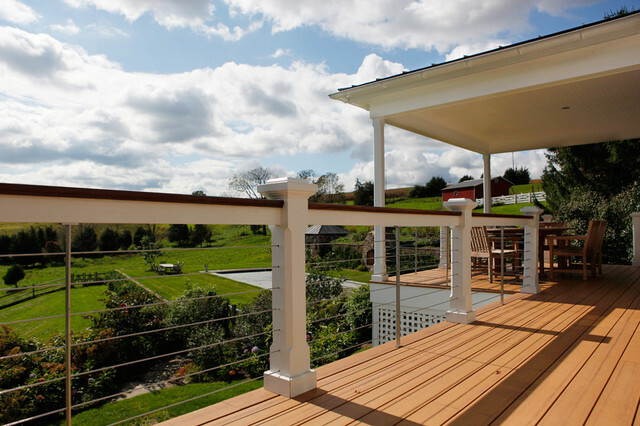 The enclosure was custom built with old beadboard paneling and antique wood beams." Viking stove (5+ burner with grill) for big home.